The science building at St Andrews University went up in flames at around 5pm on Sunday. More than 30 firefighters are tackling a blaze in a science building at the University of St Andrews in Fife. Eight fire engines raced to the scene after the alarm was raised at around 5pm on Sunday. The building, which is shared by the university's Schools of Chemistry and Biology, is in the North Haugh area of the town. Around 100 staff and postgraduate students work in the building. A spokesperson for the fire service confirmed the blaze involved "suspected hazardous materials". 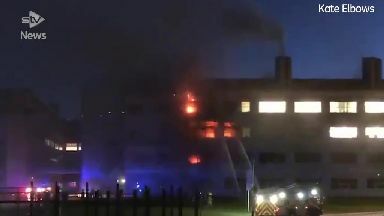 Videos posted on social media showed flames and smoke rising into the air from the four-storey building. The fire service said there were no reports of any casualties. Roads in the area have been closed to allow emergency vehicles access to the scene. 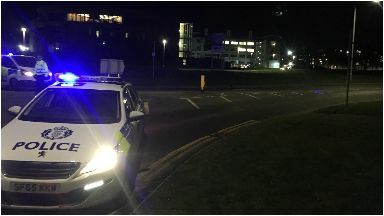 Police Scotland tweeted: "All routes into the roundabout at the Old Course Hotel are currently closed. Please avoid the area." Built in the late 1990s, the four-storey structure houses laboratories where scientists conduct medically focused research in organic and synthetic chemistry, virology and microbiology. The university said it is known as a centre of excellence addressing issues such as antibiotic resistance and infectious disease.